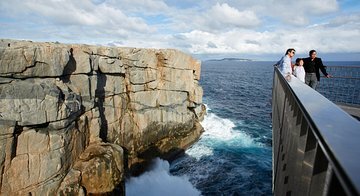 Head to Torndirrup National Park, just south of Albany across Princess Royal Harbour, on this tour that features some of the natural attractions of Western Australia's southern coast. You'll have the chance to take in a 360-degree view of the ocean and rugged shoreline from the summit of Stony Hill, admire native bush scenery, and see the Gap and Natural Bridge, where waves crash against granite walls. Great experience! Fantastic views, very knowledgable guide, all of us loved the cheese and coffee break!